The federal Bureau of Labor Statistics recently reported that the 10 largest occupations (as of May 2013), accounting for more than a fifth of all U.S. wage and salary jobs, are predominantly low-paid ones — cashiers, sales clerks, fast-food workers and the like. That’s broadly been the pattern in U.S. employment for many years. But overall employment has become more concentrated in those largest occupational categories over the past decade or so, and well-paying jobs account for a smaller share of them. We examined data from the Occupational Employment Statistics program, a federal-state effort that began in its current form in the 1990s and estimates employment and pay levels for more than 800 specific occupations, from CEOs to janitors. (Self-employed Americans aren’t covered.) Each year’s estimates are derived from the most recent three-year period, for a combined 1.2 million employers. The new OES data also shed some light on who would be most likely to benefit from a higher minimum wage. With economic inequality again part of the national political discussion, President Obama and other Democrats have pushed for raising the federal minimum wage to $10.10 an hour, from the current $7.25. 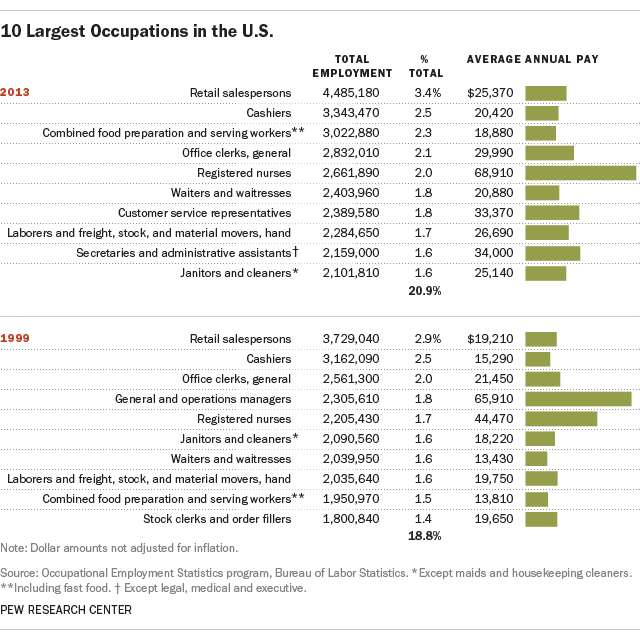 According to the OES data, just over 13 million people (9.9% of total employment) worked in occupations in which the average hourly pay was less than $10.10. They’re overwhelmingly in food service, personal service and sales jobs.